YAY!! We made it! We’ve officially hit the tenth outfit in the #Summer10x10 Challenge and even though it feels bittersweet, it’s great to have another one under my belt (so to speak!). My co-host extraordinaire, Caroline (of Unfancy) and I could not be more thrilled with the turnout and the positive response to this edition of the 10×10 Challenge. It’s been an absolute blast! First, a huge thank you to my blogger bestie Caroline for another great challenge. I truly couldn’t ask for a better co-host! I’m always learning so much from Caroline and her genuine spirit never fails to shine through. You’re a gem girl! Now, thank you, so much, for joining in and following along! I’m always blown away by how many kind, smart, creative and insightful people see merit in this exercise and are willing to put themselves out there. By joining us and inviting your friends and coworkers you’ve helped us create and grow a space that’s encouraging, supportive and friendly. Those words aren’t ones we usually associate with fashion but through this community I believe we’re making our connection to style much more positive and meaningful. If you missed this round of the 10×10 Challenge, don’t worry! You’re always welcome to give it a go on your own time but we’ll definitely be back with another one next season. In the meantime, get all the info you need to try it out here. On Monday I’ll be sharing my usual recap with personal findings and insights from the 10×10 community, along with a few bonus looks and some favourite posts from the feed. But before I sign off for the weekend, let’s take a look at outfit #10! TEMPERATURE – High of 28º C and sunny. ACTIVITIES – Polishing off some office tasks in the morning. Then we’re heading to Hamilton for our dear friend’s wedding! I’m so excited to celebrate with them and get my dance on after two very busy weeks. This look will be perfect right up until I change into my dress (or jumpsuit, still deciding) for the night. INITIAL THOUGHTS – This is probably my favourite look from the whole challenge. It’s not revolutionary by any means but I just feel kind of fabulous in it. These jeans have definitely been my most frequently worn item over the last two weeks because they’re super comfortable and I really, really like how they fit. 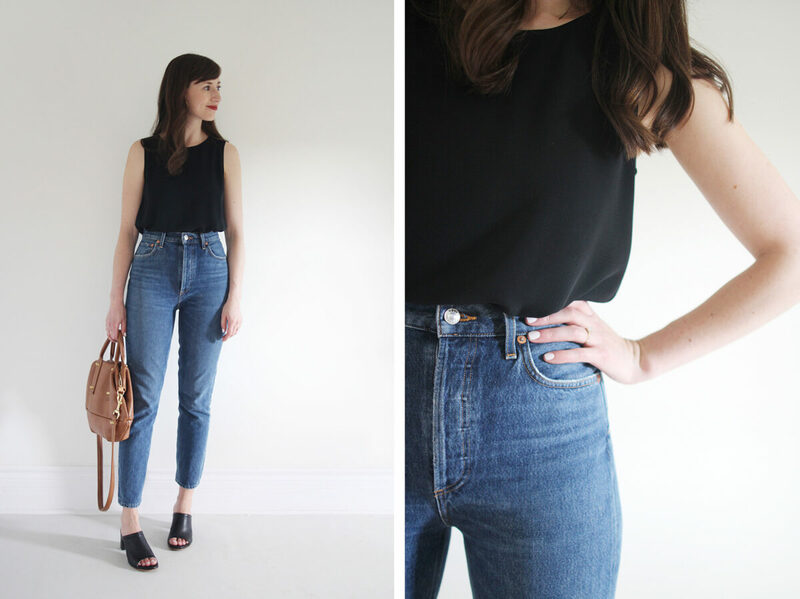 Few pieces of clothing can provide confidence the way a good pair of jeans can. 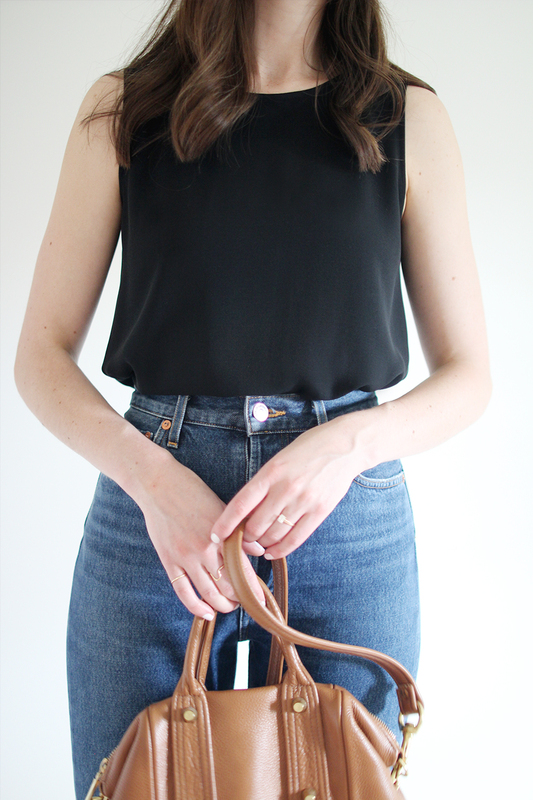 Paired with this timeless silk tank, a contemporary shoe, a minimal statement earring and an old favourite bag I’m feeling totally at ease but empowered at the same time. If it weren’t for this challenge I might never have put these pieces together but I’m oh so glad I did! It’s funny how the last look in the 10 x 10 Challenge has often been my favourite (not always though!). I never really ‘save’ looks until the end but it’s usually the final one where I feel like I’m really hitting my stride. There were a few other looks I tried (I’ll share those on Monday) but they didn’t quite hit the mark for me like this one did. 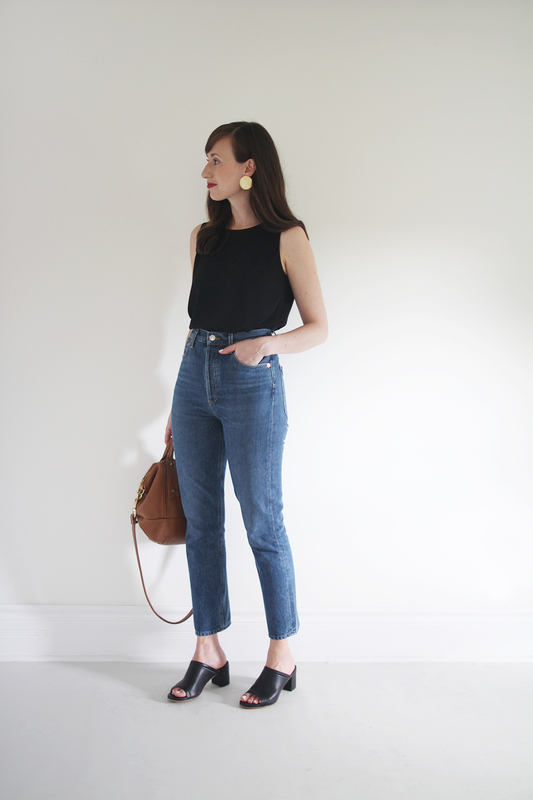 I love this simple formula (Tank + Cropped Jeans + Mules + Statement Piece) and I’m excited to try it out with other items in my closet soon! 1 | ANKLES AWAY | I’m really into the mule trend right now and I think it’s partly because I’ve been on the ankle crop bandwagon for so long already. These two styles really are best pals and it’s the perfect time of year to embrace their love. 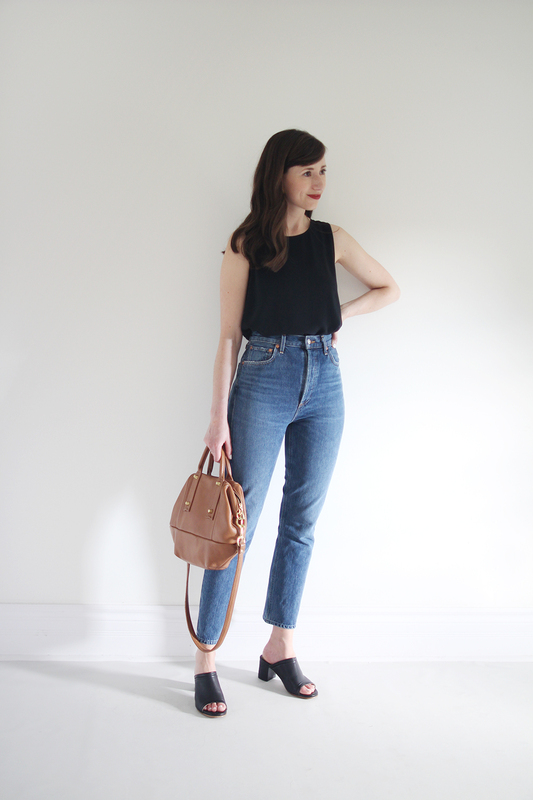 Mules with a full length pant are fine but with a cropped inseam, suddenly everything just feels and looks way better. I’ll certainly be keeping that in mind as the season goes and trying out different combinations of the mule shoe + ankle crop denim combo. I dare say the might be a new 1 Formula – 3 Ways as a result! Is there a certain combination of shoes + bottoms you’ve been particularly into lately? 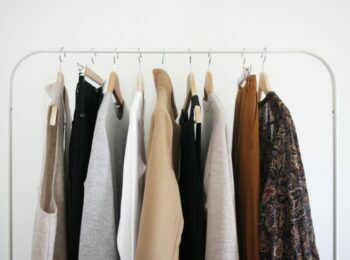 Why not embrace it and see how many ways you can create it within your closet. 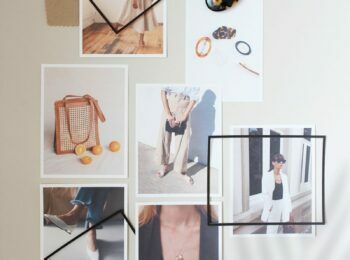 Maybe it’s a strappy sandal and a midi dress or it could be a block heeled shoe with a wide leg pant, maybe it’s sneakers and a shift dress that’s getting you going. Just roll with it! 2 | SHORT SILK TUCK | I’m no stranger to the fully tucked top trick and I rarely shy away no matter the material. That said, silk is hands down the easiest to work with and drapes perfectly. 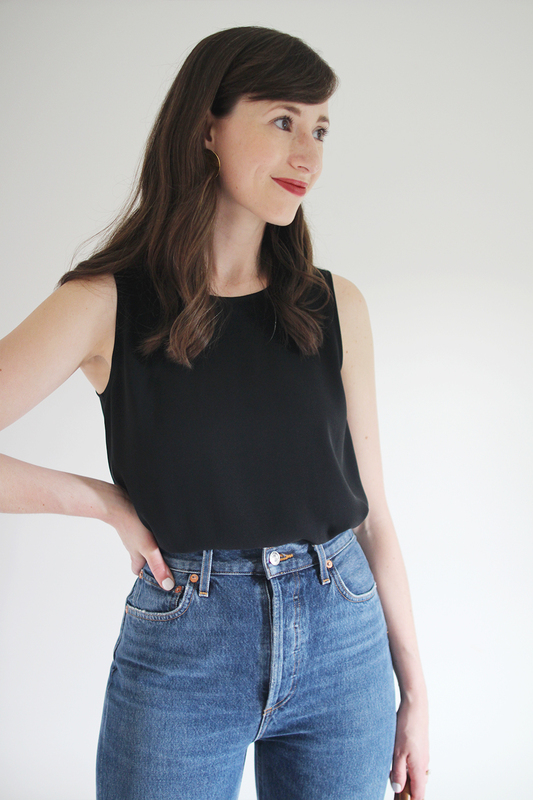 This tank in particular is great because it’s a shorter length so I have less material to manage and the cut is straight and relaxed so there’s a touch of volume to work with. As a result this shirt tucks in neat and tidy without any fuss or much necessary adjusting throughout the day. 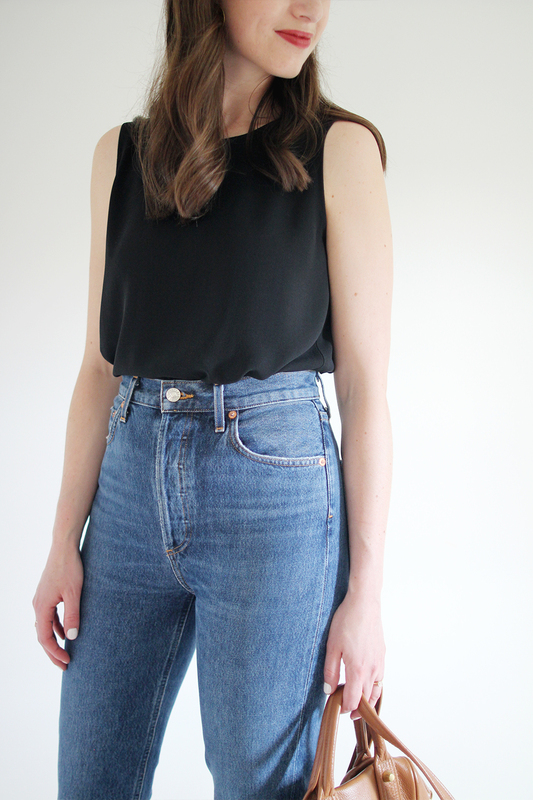 If you’re trying a full tuck for the first time in a while go for a shorter length top in a silky fabric. This will make your styling life way easier! Long tops can feel bunchy and stiffer fabrics can give you trouble when it comes to how they fall around the waist. 3 | ‘ELEGANCE IS REFUSAL’ – Coco Chanel | I just read this quote the other day and it really hit home. 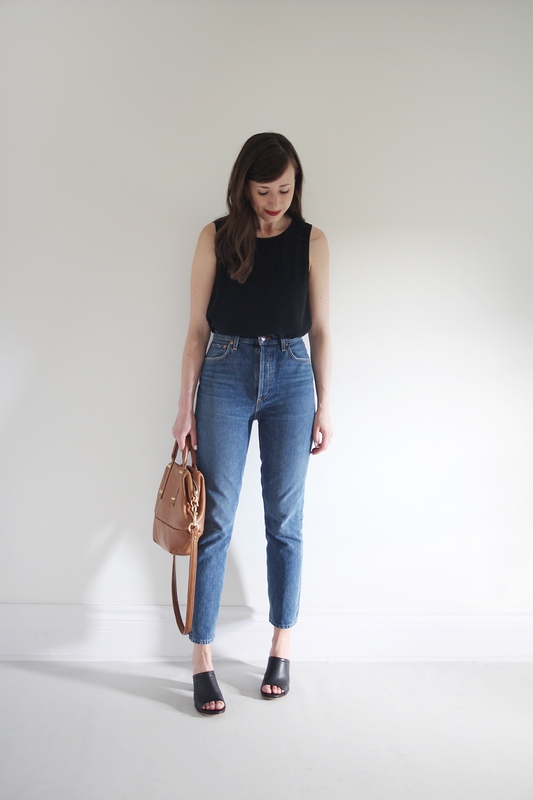 Achieving a minimal personal style really just comes down to exercising restraint. Whether it’s to forego an added accessory or to pass on a piece with too much pattern or to opt for less colour I try to refuse the ‘extras’ and with time and practice it’s made a big difference. Sure, sometimes that ‘extra something’ is totally needed but I think, especially throughout this challenge, it’s been very helpful to consciously consider every element of a look rather than simply adding more because I can. Next time you’re getting ready try to keep the look as simplistic as possible and see how it feels. Is it too plain? Are you bored? Or do you feel chic and sophisticated? You might just end up finding out that elegance is easier to achieve than you thought. 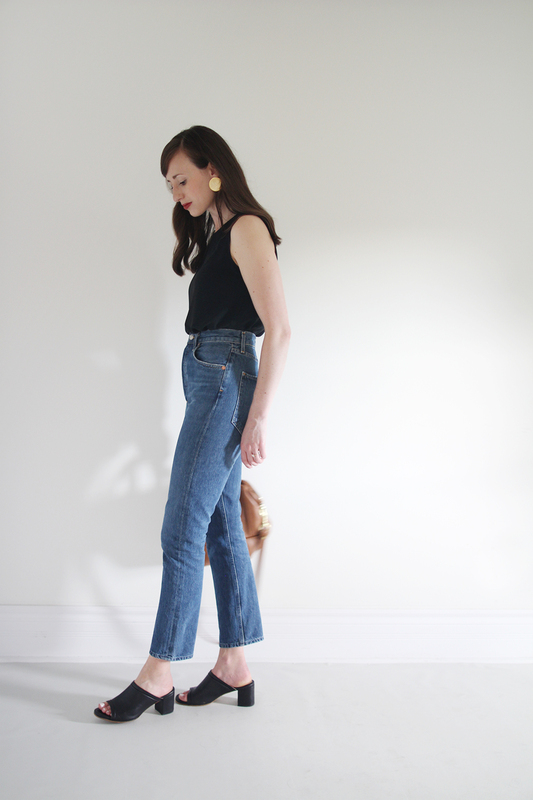 I waited until the end of the challenge to share my thoughts on the Peep Toe Mule from Poppy Barley because I wanted to wear them as much as possible and see how they broke in. Turns out the break-in was pretty much a breeze, save for a few scuffed toes and these are truly one of the most comfortable pairs of heels I’ve had the pleasure of testing out. It’s also pretty cool that they’re made responsibly by a Canadian company. Oh and they’re currently on sale! FIT: I typically wear a US 7 and have a narrow foot so I got these in a 7 Narrow (I love that Poppy Barley offers different widths for their shoes!) and they fit like a glove right out of the box. Poppy Barley says to size up half a size if you are in between sizes, or have a high arch but I took my normal size and I’m very pleased with the fit. There is no gapping and they’re not too tight. That said, for a Mule style I wanted to make sure the fit was very snug so they wouldn’t slide off or stretch too much. COLOURS: These are available in Black leather, Honey Leather, Grey Nubuck and Red Nubuck. PRICE: $248 USD $208 USD – Currently on sale! MATERIALS: A full-grain, smooth leather with a natural wax and a glossy finish. COMFORT: These mules are seriously so comfortable it’s silly. Right out of the box the leather was soft and supple. The memory foam footbed is amazing and even after a full day in them the balls of my feet are totally fine. As I mentioned above the fit is snug but very comfortable and I never feel as though they might slip off, which I know is a major concern with Mule style footwear. I appreciate that the sole comes with a cute Poppy Barley pattern etched into the leather sole to give it texture and grip so it’s not slippery at all when you first get them. The only discomfort I’ve experienced so far was on my toes after a fair amount of walking and running errands. Where the peep toe starts, the edge of the leather rubs on the top of my toes when I bend my foot. I’ve been wearing some pre-emptive band-aids and this has helped the break-in process. Otherwise there has been no rubbing or issues. 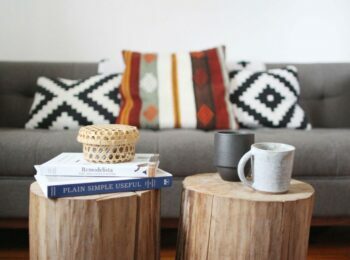 MADE IN: An ethical factory in León, Mexico. These shoes both look and feel incredibly well made. CARE + DURABILITY: I haven’t sprayed these yet but they still look exactly like new and I got caught in downpour while wearing them last week. If you go for the lighter colour or the nubuck you’ll definitely want to protect them. I’ll give them a wipe down as needed, then deep clean and condition them before they go back into my closet for the Fall/Winter. I’ve been wearing them on sidewalks, streets and gravel and while the leather sole is getting scuffed and worn in it’s holding up really well. These heels definitely feel like they can take a beating and were made to be really well-used. DETAILS: I immediately loved the clean, minimal shape of this shoe and felt the proportions were elegant and timeless. The block heel is sturdy and substantial but not too high to walk in very comfortably or stand on for a long time. The band that covers the top of the foot hits at a very flattering spot and the angled cut makes it very comfortable. My only comment on the design of this shoe is that sometimes I feel like the heel is being forced back slightly when I’m walking quickly. I think this could have been prevented by designing the heel with a slight angle on this inner side (towards the toe) to counteract the force of the forward motion. Here is an example of what I mean. The heel is definitely sturdy and I can’t really see a difference in how the shoe looks on even when I try to recreate the motion in front of a mirror, so I could be imagining it! Overall, I’d say these are a great summer heel option, which will transition really well into the fall. Any other questions about these? Feel free to ask away in the comments. 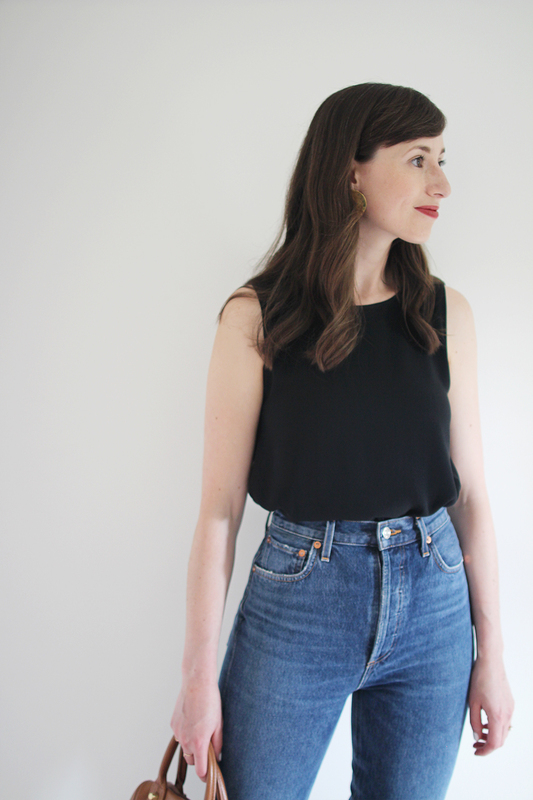 I received the Boxy Silk Shell as part of a collaboration I did with Eileen Fisher earlier this year and it has since become a favourite and a total closet hero. I’ve raved about the Silk Tunic which is from the same collection but this top really holds its own. I’ve found it very comfortable, easy to care for and awesome for wearing loose, tucked in, front tucked or layered under another piece. Plus it has a very flattering cut and is made of a beautiful crepe silk fabric. It’s a closet MVP without a doubt. Honestly, I could have happily worn this tank every day of the 10×10 Challenge! FABRIC: 100% Silk, which is Bluesign® certified silk, dyed with safer chemistry. Eileen Fisher’s signature Silk Georgette Crepe has a subtly textured matte surface. The fabric (and cut) gives this top a great shape which falls away from the frame for a very warm weather friendly effect. CREASING: Unlike other silk pieces I have, this crepe silk doesn’t wrinkle as easy. If it’s worn loose you probably won’t see any wrinkles but if it’s tucked in folded for a while you will have a line. It’s super easy to steam any creases out if you need to though. FIT: I’m wearing the XXS and I’m 5’7, 125 lbs with a 32C bust for reference. 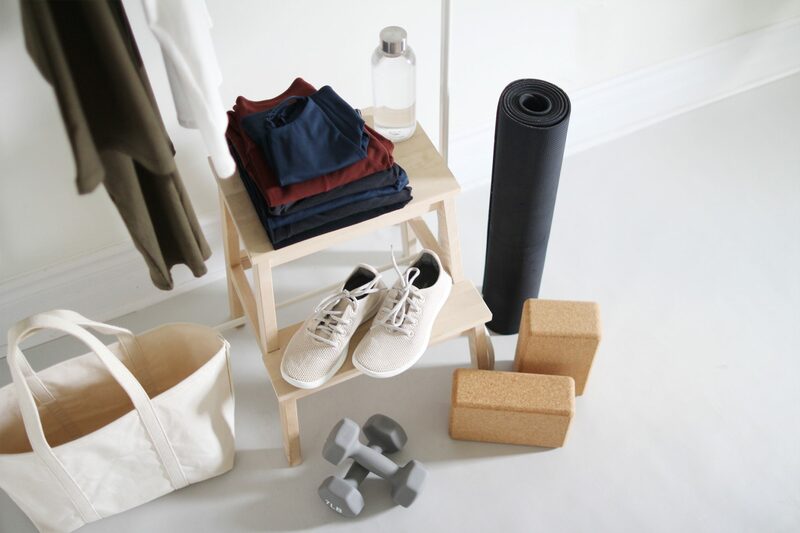 Eileen Fisher runs at least one size large so keep that in mind when ordering. 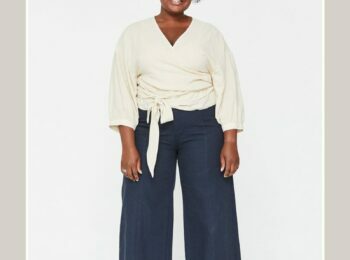 The length is about 21 inches from shoulder to hem and hits at the top of my hip which makes it a great top to leave out or tucked into a high-rise pant. The armholes are cut close to flatter the arm and conceal your bra completely. The body of the top is cut straight (no curves) and wide so it falls away from the frame. 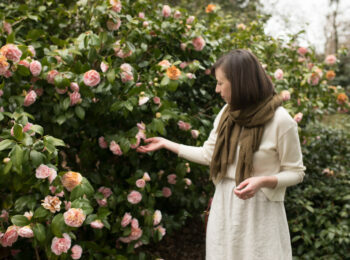 The crepe silk is super fluid and moves beautifully so it never feels too boxy. DETAILS: I love the high, round neckline on this piece and the small keyhole closure on the back (which you don’t need to undo but is cute). Another small design element I like is the 1 in side vents which help it fall really nicely when front tucking. CARE: Machine wash cold. Hang Dry. Iron smooth with steam. COLOURS: This piece also comes in Bone (an off-white), Cobble Stone (Taupe on sale) and Blue (Periwinkle on sale) and is also available in Jersey (3 colours) and in similar styles in Organic Cotton (3 colours) and Organic Linen (5 colours). MADE IN: Made Responsibly in China. LENGTH: Petra Crop is 17 in shoulder to hem (Small). Silk Shell is 21.5 in (XXS). WIDTH: Both the Silk Shell and the Petra Crop are 18 in across chest when flat. 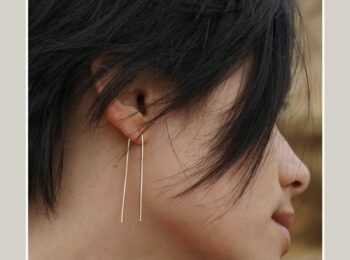 4 | CIRCLE EARRINGS | c/o MASLO JEWELRY | $38 USD | Made in USA | STAY TUNED FOR A GIVEAWAY NEXT WEEK! 5 | LIP COLOR | KOSÅS | $24 USD | Free of parabens, phthalates and sulfates and handmade in USA. 6 | mVANDA | c/o OPELLE CREATIVE | Made in Toronto. Available in Black and Buff (on sale). 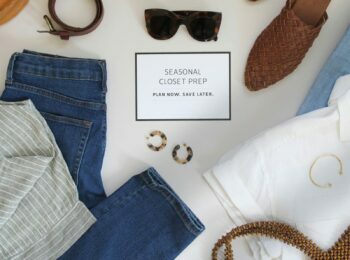 WELL FRIENDS, THAT IS IT AS FAR AS OUTFITS GO FOR THIS #SUMMER10x10 Challenge! I’LL SEE YOU ON MONDAY WITH A FULL RECAP SO THINK ABOUT YOUR CHALLENGE TAKEAWAYS BECAUSE I’D LOVE TO HEAR ABOUT THEM! BE SURE TO CATCH CAROLINE’S FINAL LOOK TODAY TOO. WISHING YOU AN ABSOLUTELY WONDERFUL WEEKEND! I really love this challenge and have tried it a couple of times in the past year, but unfortunately I never seem to make it. Four tops just aren’t enough, since I have to put them in the laundry basket after a days wear… and I just don’t have enough to do laundry in 10 days. Do you have any tips on how to complete this challenge with two dogs and a very variable climate? For a variable climate I’ve found it helps to exclude things like base layers (tanks, bodysuits, etc.) and have those available if needed. A base layer can sometimes get you an extra wear out of a top which can help the laundry issue. Have a great weekend, and enjoy your friend’s wedding. This is one of my favorite looks too. Timeless. Hope when you do the fall 10×10 it will be post baby enough to join in again.